Just like humans, animals feel pain. Granted, they may not have the intelligence to build a skyscraper, but they do have intelligence, emotions, and are living, breathing, and conscious beings just like we are. Indeed, all things, from insects to plants, aquatics, and the innumerable single-cell organisms that exist everywhere are alive with purpose. The engine of life is linkage. Everything is linked. Nothing is truly self-sufficient. Just as water and air are inseparable, so too is the interdependence of all living things. We are all united in life for our survival on Earth. Sharing is everything. This recognition of the oneness of all life is the basis of a truly humane society. 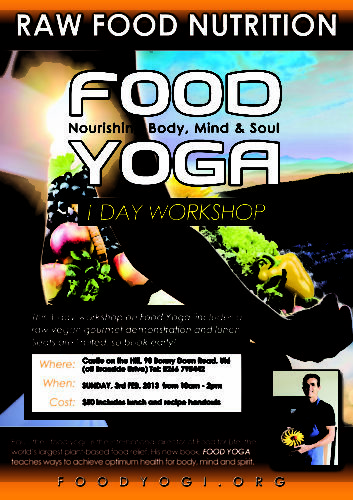 It is the acknowledgment of this interdependence and the need for balance and gratitude that is central to FOOD YOGA. Our journey begins in the domain of molecular science and quantum physics and establishes the fact that food, like everything in this world, is essentially just another form of energy. However, this awareness often eludes us, humans, because we are either too busy consuming food to bother; or we lack the heightened level of sensory perception necessary to notice. This is no more clearly evident than in our embarrassingly poor perception of the electromagnetic spectrum. Like food, our thoughts are also a form of energy, and therefore they can influence the food we consume, much like conflicting radio waves may scramble a clear signal. When we care more about this powerful influence on our food we will think twice about where we buy our food or where we eat out. Drawing on numerous mystic traditions, including that of the American Indian, we venture into the esoteric realms of nature spirits and the key role they play in the interplay of energy. This path reveals the sacredness of water and the pivotal role it plays in solving the riddle of how to reconnect with our Source. Although we may not be of this world in spirit, we are certainly bound to it through flesh and the body’s concomitant needs. So our journey must, somewhat begrudgingly, take a slight detour to the mundane world of food politics, but makes a strong case for growing our own. Returning to the central theme of FOOD YOGA, we look at the nature of our true self and how we are not only surrounded by energy, but are in essence energetic beings all earnestly seeking the same things: harmony and love. Having set the framework, we take a deep look at the Yoga tradition and how it can help us prosper in body, mind and spirit. Yoga is all about connection, but it begins with managing the mind and senses, of which the tongue is the most important. How we use our tongues, therefore, is a critical piece of the puzzle. Since eating is one of the two main functions of the tongue, and so central to our survival, it is logically one of the most effective mediums for initiating change in consciousness. Each of us has had the experience of sitting down to a meal cooked with love and felt an immediate transformation of consciousness followed by a feeling of reciprocal love for the person who prepared the meal. The fact is, when food is prepared with a loving intention it can communicate in any language. Such food has the ability to break down barriers and turn anger into love, fear into trust, and ignorance into enlightenment. This is no more evident than in the loving exchange between a mother and child. When you are living consciously, beginning with conscious eating, you will do so in all your thoughts and actions. Your life will be consistent and in harmony with your environment. In other words, you will complement your environment and not disturb it. Rather than being a “spoke in the wheel” of Nature, you will be a welcome participant in the garden of unlimited possibility. In this context, Pollan specifically refers to the poor health of Americans who are seemingly obsessed with the nutritional content of food at the expense of common sense and happiness. In FOOD YOGA we will explore how a more inclusive and respectful attitude toward food and its origins can improve the overall health of your body, mind, and soul. The Bhagavad Gita states that all foods can be classified according to their inherent quality and the way they affect our body and mind. Foods characterized by goodness increase the duration of life, purify one’s existence and give strength, health, happiness and satisfaction. Such nourishing foods are sweet, juicy, fattening and palatable..
Jeremy Rifkin, in his eye-opening chronicling of the meat industry concurs that eating, more than any other single experience, brings us into a full relationship with the natural world. The act itself calls forth the full embodiment of our senses—taste, smell, touch, hearing, and sight. We know nature largely by the various ways we consume it. Eating establishes the most primordial of all human bonds with the environment, and that is why in most cultures the experience is celebrated as a sacred act and a communion as well as an act of survival and replenishment. Eating, then, is the bridge that connects culture with nature, the social order with the natural order. In FOOD YOGA we take this concept even further to the point of seeing food as the ultimate peacemaker among all men, animals, and the environment. If we humans honestly recognized the equality of all beings, the collective result would be a desire to share the bounty of the earth and forego all selfish tendencies. The fact that humans do not acknowledge this equality (especially world leaders) is clearly evident in the case of world hunger. “The problem is not insufficient food production, but inequitable distribution,” explained UN secretary general, Dr. Kay Killingsworth. Killingsworth made that comment in 1996 and yet here we are in 2011 and world hunger continues to haunt the UN and their Millennium Development Goals (MDG), even though world food production has increased exponentially. How is this possible? I believe the issue is not only inequitable distribution but also horrendously biased economic policies. For example, can anyone of right mind honestly justify why 35.5% of all grain production in the world is fed to livestock and not humans? This figure is alarming when we consider that on average, one child dies every five seconds as a result, either directly or indirectly, of hunger – 700 every hour – 16,000 each day – 6 million each year – 60% of all child deaths. In 2011 there should be no hunger whatsoever. I wonder how many burger-eating Americans and Europeans realize that the majority of this grain is fed to beef cattle grazing on deforested Amazonian lands? According to the FAO, the factory farming of animals is the most inefficient and environmentally damaging industry in the modern world. Of course, world hunger is a very complex problem, but without doubt, if humans learned to look past racial, religious, ethnic and species differences, there would be no scarcity anywhere in the world. What one entity lacked in its ability to sustain itself, another could contribute through free knowledge, labor exchange, or bartering. It is the symbiotic relationships formed between humans, animals, insects, plants, birds, and fish that have enabled all species to survive throughout the ages. Unfortunately, the modern capitalist system breeds greed and dishonesty and thus stands in the way of a conscious, sustainable society. Such an ideal society would consist of, what I call, Food Yogis or responsible humans that serve, consume, and behave in ways that respect all of creation and help maintain the delicate balance of nature. 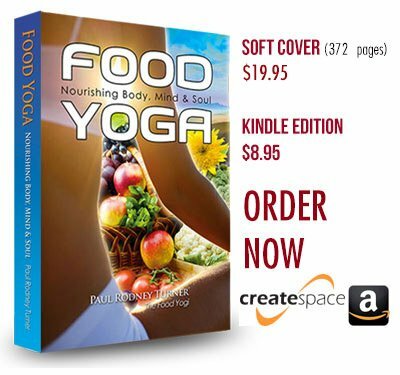 Food Yogis respect their own body, which they treat as a blessing or a “temple of God.” Indeed, they live their entire life in full awareness of their interdependence and interconnectedness to all things. Such a spiritual and all-embracing perspective is the foundation of India’s Vedic culture of hospitality—a culture that is based on the principle of sama darshana or spiritual equality. The Food Yogi fully embraces a socially responsible and environmentally respectful lifestyle. This applies to your choice of food, clothing, cosmetics, cleaning materials and habitat. All should be chosen carefully so that the least amount of harm is inflicted upon your environment and other living things. This journey in raising consciousness begins with and ends with the tongue. Never underestimate the power of the plate or the power of the spoken word. What you put on your plate is as much a political statement as it is a mirror of who you really are. You can tell much about a person by what comes out of his mouth when he speaks and what he consumes as food. Food for Life founder Swami Prabhupada often gave the example of a dog on a throne. “If you throw a shoe, then the dog will leave his throne to chew the shoe,” he chuckled. Similarly, although an individual may claim to be enlightened or a great moralist, actions speak louder than words, and soon enough those actions will always reveal their true nature. The tongue will always lead the other senses either to purity and thus liberation, or to debauchery and thus perpetual entanglement in sin. 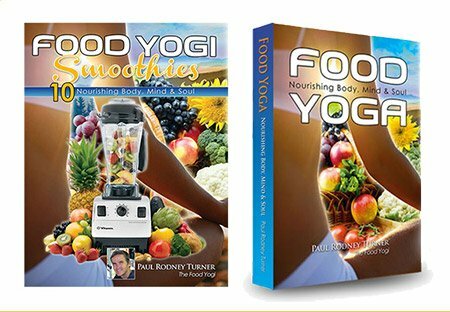 In this spirit, FOOD YOGA provides a Food Offering Meditation that encapsulates the core lessons learned along the journey, while also respecting the need for the individual to be able to use this meditation within the context of their preferred spiritual tradition. 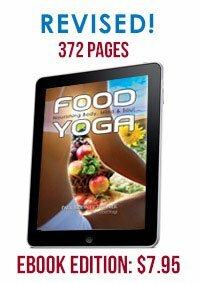 FOOD YOGA aims to do this by teaching universally accepted principles of science and spirituality and not dogma. 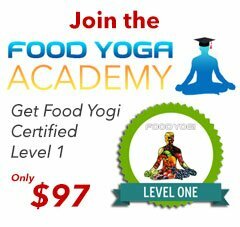 In FOOD YOGA, I also share my personal experiences as a young monk and student of India’s Vedic culture of hospitality, while also drawing from numerous scientific and religious sources to provide a believable framework to elevate the act of eating from the shackles of the mundane to the liberating embrace of the transcendental.